So far this year, luxury SUV’s are leading the charge in an increase of sales, up 25.7% just so far! Because gas prices are down this year, sales in SUV’s and trucks have been dominating the market. As demand in this segment increases, the market becomes more competitive. We’re already seeing the results of that with redesigns and updates. Manufacturers are adding special features and expensive touches wherever they can. If you’ve been thinking about how comfortable your life would be in a luxury SUV, this year is the time to do it and it couldn’t be easier to make that happen. Some clicks of a button and your online car shopping experience has let you custom order your SUV. All that’s left to do is wait for its arrival! Debuting its new and long overdue redesign, everyone can agree the midsize Audi Q7 is definitely a better SUV. This second generation Audi sits on a new platform that several Audi and VW models will adopt in the upcoming years. The exterior styling is more aggressive with clear strong character lines and muscular wheel arches. A handsomely crafted interior boasts a spaciousness that passengers in all three rows can stretch out in. Losing 700 lbs in its redesign after making ample use of aluminum wherever possible, the Q7 is notably more fuel-efficient than its predecessors. Standard rear-biased all-wheel drive and available adaptive air suspension contribute to livelier handling. Like its predecessors, Audi offers two engine choices: 3.0L gasoline engine or a diesel V6. My favorite new feature on the Q7 is an optional adaptive cruise control system WITH a traffic jam assistant. Hate being stuck in traffic? Let the assistant take over. It’s difficult to explain this without thinking of the autopilot which takes over control of the cockpit in the movie Airplane! this assistant has control over accelerating, braking and steering of the vehicle under speeds of 40 mph on well-marked roads. Taking advantage of a rename for this updated version of the former M-Class SUV, the GLE Class features redesigned styling and new variants including a plug-in hybrid and an oddly labeled 4-door coupe. New headlights, taillights and front and rear bumper give the GLE a definite identity. The GLE’s interior is nicely finished offering a myriad of upgrades with a long list of convenience and safety features available. As a five-passenger SUV, it lacks the third row, but honestly, sometimes less good and what’s that saying? Ah, yes. Silence is golden. If you are someone who respects the power of choice, or choice of power in your SUV, this GLE class is perfect for you. Offering two V6 gasoline engines along with two powerful V8’s, a plug-in hybrid AND a fuel saving four-cylinders turbodiesel, your choices are open. The much-anticipated high-performance AMG GLE63 version will feature a 5.5L twin turbocharged V8 that delivers 577 horsepower. A new dynamic handling control system maximizes the vehicle performance according to selectable driving modes, including individual, Comfort, Slippery and Sport. AWD-equipped models include additional off-road settings. Best new features on the GLE Class is the Active Curve System which constantly adjusts the SUV’s side-to-side stability during cornering making for higher levels of handling performance. 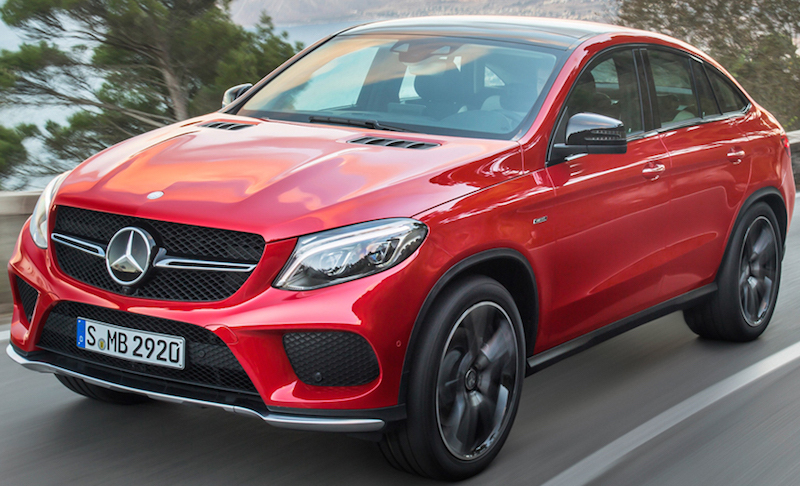 Mercedes GLE class should be ready for release this fall. As Tesla is well known for their electric vehicles, the long-awaited follow-up to the popular Model S is now an all-electric SUV appropriately called, the Model X. Though initial expectations for delivery were for this fall, delays may be pushed until early 2016 and insiders worry that it may be pushed back even further. Do we really have to wait for that much longer to get our mitts on this sleekly styled crossover? Details still remain to be seen. What we do know so far is that the Model X is a seven-passenger crossover which more closely resembles a tall-roofed hatchback car with a rounded coupe-like roofline and an aggressive looking front end. By far its best, and soon to be a signature, the feature is the falcon wing rear doors that fold up and out for easier access in and out when parking when parking in the crowded streets of Monte Carlo. 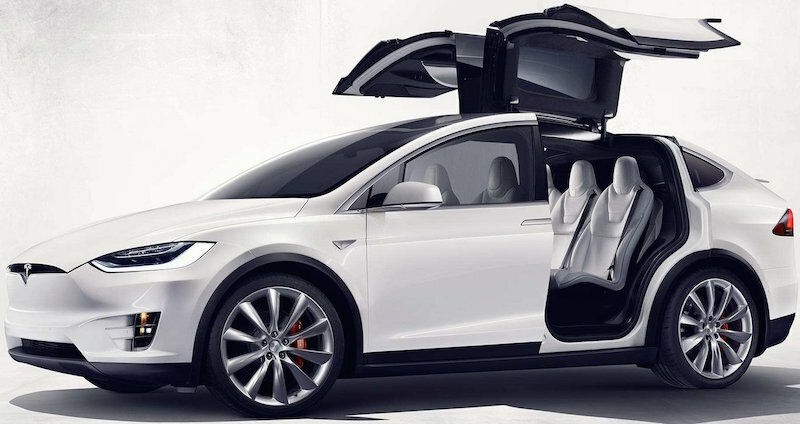 Picture the DeLorean in Back to the Future, but because these doors fold up first and not out, the Model X is actually cooler. But we don’t hold that against Doc Brown. We know we can expect all the high tech luxuries in the cabin, like the Model S. Standard AWD will be powered by two separate electric motors. 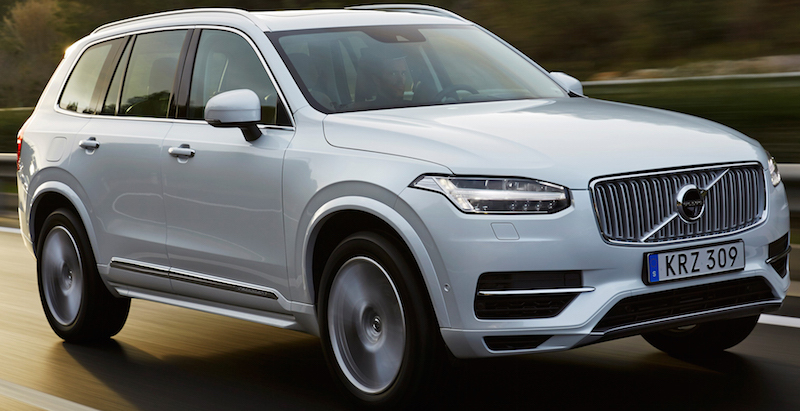 Redesigned for this model year, the XC90 is the top tier luxury SUV from Volvo. Offering the ever popular third-row seating, the back passengers, while still recommended for children or small adults, does provide more leg and headroom. The second-row seating is heated and includes three individually reclining seatbacks. We’ve been prepared to expect more luxuriously crafted interiors like genuine wood, real carbon fiber and a gearshift lever fabricated from Swedish crystal glass. An impressive 2.0L turbocharged and supercharged four-cylinder engine is rated at an even more impressive 316 horsepower and comes mated to an eight-speed automatic transmission. AWD is standard. An available plug-in hybrid puts out a combined 394 horsepower with an estimated 17-mile range on battery power alone. Debuting a brand new safety feature on the XC90 is what Volvo calls Run-off-Road protection. Should the vehicle go off the road, the seatbelts automatically tighten up and the seat cushions are designed to absorb impact forces if the vehicle comes down hard on its suspension. Other safety features include the surround-view camera, blind-spot monitoring, rear cross-traffic alert, lane-departure warning and lane-keeping assist. Appealing to the families, a child booster seat is built into the center position of the second row and moves forward for easier access to front seat passengers. As “the most upscale, high-quality interior we’ve ever offered in a Ford vehicle in North America”, yet it isn’t the first Explorer to don the Platinum nameplate. It is, however, the first that’s been able to contend with brands like Mercedes and Land Rover in luxury quality and accessories. The Platinum Edition is the best appointed CUV Ford has ever offered a buyer. While third row seating is of huge interest in this market, the Explorer has always provided their buyers with ample passenger seating and the Platinum Edition is no exception. Standing out from the rest of the Explorers, the Platinum Edition has an immediately noticeable style. Adding extra sparkle are headlights with LED signature lighting, dual-panel moonroof, silver-painted front and rear skid plate elements and 20” wheels with bright machined face and tarnished dark painted pockets. A brand new Explorer gets a brand new engine. As a crossover this now smaller Explorer gets started with a very powerful 3.5L twin-turbo EcoBoost V6. At 5,500 rpms, it delivers 365 horsepower and 350 lb/ft of torque at 3500 rpms. This engine is powerful enough that it can easily tow 5,000 lbs. It is also mated to a six-speed SelectShift Automatic Transmission. Inside the cabin is where the Platinum really shows up. Pristine craftsmanship abound. Sony is proud to announce that the 2016 Explorer Platinum is the first Ford vehicle to get the all-new 500-watt Sony Audio with Live Acoustics and Clear Phase technology. This excitingly new audio system recreates the sound dynamics of famous concert halls.